This morning we had Kickboxing and MMA sparring and in an hour is Wrestling up at UNC. 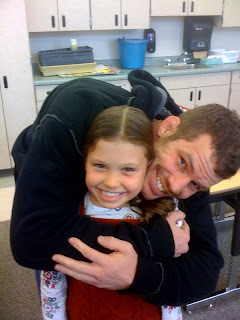 Here's a picture from earlier at Emmalie's school. You can see where she gets her good looks from! LOL! Also tomorrow I leave for San Antonio at 6am. Wish me luck for waking up on time.